write a Carmelo rant for our sports blog today.” It was followed by an e-mail from Grantland editor Dan Fierman, also calling me out for “whine, whine, whining” on Twitter instead of really saying something. OK, boys, if it’s a rant you want, it’s a rant you get. But I’m warning you, it ain’t gonna be pretty. It ain’t gonna be stat-filled or fair and balanced. Because after a lifetime of Knick fandom, I don’t have an ounce of fair or balanced left. Let’s start with the disgraceful commercials the Knicks ran in welcoming Carmelo Anthony to the team. These ads, designed to stir the emotions of long-suffering Knickerbocker lifers like me, had the audacity to compare this selfish, ball-hogging, team-chemistry killer to Bernard King, probably the most beloved Knick of all time, after Willis Reed, and the one Knick since the ’70s who performed in the clutch, played hurt, never complained, and gave us hope that we might actually win a championship. This is not unlike comparing Paulie to Luca Brasi in The Godfather. One sells out the Don for a few extra bucks. The other dies for him. You want specifics? Well, it’s not about any complicated sports-geek metric. It’s just this: The Knicks are a winning team without Carmelo, and a losing team with him. I can talk about shots per game, Mike D’Antoni’s offense, Amar’e Stoudemire’s conditioning, but what it comes down to, in the end, is that Carmelo Anthony, on the court, does not care about anything but Carmelo Anthony. Just watch two quarters and you’ll see it. First few plays, he runs the lanes, has his eyes up, even makes a pass or two. But then it starts, usually after one of his teammates misses a shot or has the audacity to throw the ball to someone other than Carmelo. That’s all the justification he needs to take matters into his own hands — which means dribbling the ball until there are about eight seconds left on the clock before shooting (and usually missing), no matter where he is on the court. Sometimes, if he’s in an even worse mood, he just dribbles across half court and fires up a 3, without even waiting for anyone else to get under the basket. And let’s not even talk about defense. Because what would there be to say? And that’s not the worst of it. The worst of it is the effect he has on all the other players. Anthony, by sulking, by demanding the ball, by refusing to even acknowledge he’s part of a team, has killed all the momentum the Knicks built up, all the team spirit that surfaced when he was injured. I believe Jeremy Lin is the real deal and will be a starting point guard in the league for a long time, but what Linsanity really boiled down to was this: a team jelling, a team having fun, a team remembering that basketball could be a great game to play. That’s an important thing in this shortened, intense season. Actually liking basketball and having a blast out there on the court results in wins. I saw it with my own eyes. And don’t get started with the whole, “The Knicks didn’t play anyone during the streak” argument. Because that’s crap. We beat the Lakers and the Mavericks — and both teams were out for blood. The really painful part of this is that most of us knew this was a mistake before the Knicks made the trade. (Donnie Walsh knew it, too, which is why he’s no longer with the team.) The truth is, the anger I feel toward Carmelo is really anger that should be directed at owner James Dolan. If ‘Melo is Paulie, then Dolan, to continue the Godfather analogy, is basically Fredo, if Fredo were twice as stupid and three times as jumpy. When Fredo panicked, all he did was fumble the gun, sit down, and cry. Dolan would’ve accidentally fired it, hitting his father another couple of times in the back, before running away and hiding. Well, I’m sick and tired of getting shot in the back by James Dolan. And, speaking for most Knicks fans, I demand that he trade Carmelo Anthony before the deadline expires. I know he won’t. Because that would require Dolan admitting he was wrong about something and then actually doing something about it. Which will never happen. And so I will spend the rest of the season curled up in the fetal position as I watch Carmelo destroy our team’s offense, our team’s chemistry, and our team’s promising point guard, Jeremy Lin. And all I’ll be able to do about it is tweet. 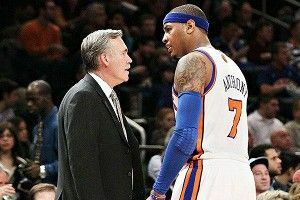 Mike D’Antoni has resigned as New York Knicks coach, a source tells Y! Sports. The news of Mike D’Antoni’s resignation broke after I penned this rant. So there you have it. Carmelo and Dolan put a bullet in the head of the guy who found a way to win with all his supposed stars on the bench. The guy who actually gave the Garden 10 days of hope. I hope whoever comes in next knows to always sit with his back to the wall and his eyes on the front door. Or at least has a gun hidden behind the tank of an old-fashioned chain toilet. Brian Koppelman is a screenwriter, producer, director, and Knicks fan. Follow him on Twitter at @briankoppelman.